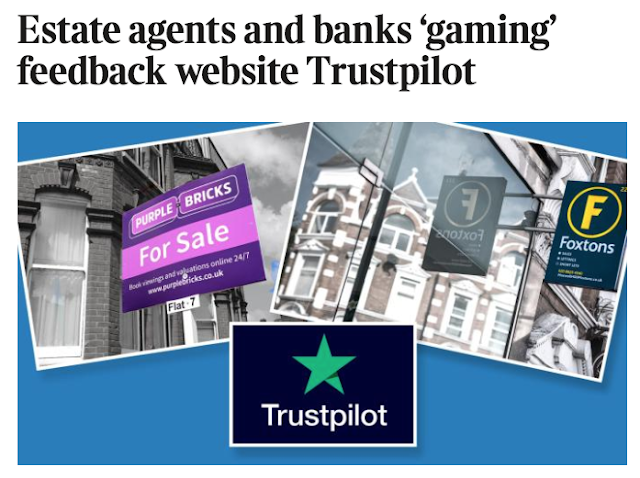 Saturday's Times carried an article alleging that Trustpilot allowed their clients to manipulate their reviews on their platform. There's a link to it here (for Times subscribers) and here is a link to an article on Property Industry Eye that repeats most of the Times article. In this analysis we will attempt to stick to verifiable facts. Now let's take the accusations levelled by the Times in order, one by one (screenshots direct form the Times online). Comment: It is possible that a business might 'save up' invitations to its customers and then invite them in one lump, Most online retailers simply embed the invitation into whatever CRM software they are using and the invitation - as many reader will know from first hand experience - will follow within days of the purchase being made. So why 'hoard' invitations? We cannot think of a single sensible reason to do so, but we have seen instances of this happening when a business is 'gating'. What is gating? Gating is the practice of pre-qualifying reviews/reviewers to establish what they are likely to say. The business will usually do one of two things: it will email customers asking them to pass an opinion or they will invite reviews to one of the less visible reviews sites. Only when they are as sure as they can be that their customer will rate them five stars will the customer be asked to write a review to the site that really matters - often Google, but sometimes sites like Trustpilot. 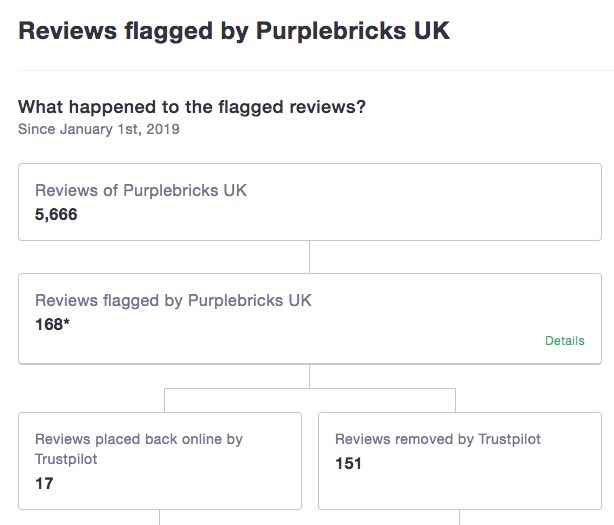 We have seen instances where Trustpilot is almost certainly the victim of this gating - where customers are all invited to write a review to Trustpilot and then only those who have rated the business 5* on Trustpilot are then invited to write a review to the site that really matters to the business. Comment: Filtering? We were surprised to see that Trustpilot were happy to see their clients displaying only 5* reviews on their own websites - citing, of all things, the behaviour of publishers and cinemas as justification. Comment: Accusations of this kind have been endemic for a while now: a common accusation is that estate agents have been asking for review upon instruction. Even more misleadingly businesses have been passing off reviews of single customer interactions - e.g. a simple phone call - as a bona fide review of the whole service on offer. We commented on this when it happened back in early 2016 (the full story is here). 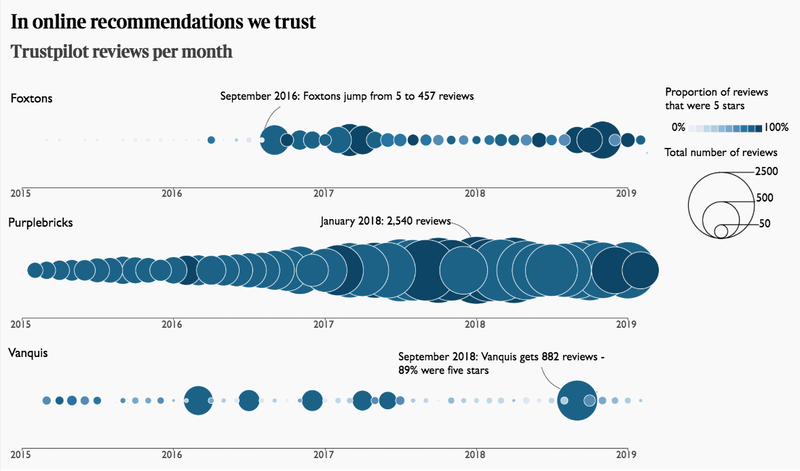 Here is the Times' infographic showing the pattern of reviews for all three companies mentioned in the article. We are surprised that Foxtons did not address this in their response to the Times. Comment: In this instance the Times is comparing one large Trustpilot client with another large business that is not inviting reviews to Trustpilot. Apples and pears really. What it does show is that a business that does not engage with a reviews platform, be that Trustpilot or - much more importantly - Google will leave the way clear for its detractors to dominate its image there. Look good on Google or Trustpilot? We know which most of our client businesses will choose. If anyone has the answer to this, please don't hesitate to contact us. Comment: This is just one of many instances we have seen. Trustpilot must ensure businesses do not manipulate any aspect of its platform for their own illicit purposes, otherwise trust in the whole edifice is threatened. Comment: This, we believe, is at the heart of most reviews sites' issues. They were invariably founded to service the online retail market - to enable businesses to show reviews and ratings of products. But with competition hotting up with the (mostly) US giants entering the market (Yelp, Reevoo, Amazon) and big retailers coming up with their own solutions (e.g. John Lewis) the reviews sites were forced into unfamiliar territory: services such as estate agency and banking. The difference, which will have surprised them, is that while consumers will happily buy a shirt or a tumble drier that scores 4 out of 5, they demand far higher scores from service businesses. Just think a minute - would you appoint an estate agency where twenty per cent of customers said 'don't us them'? Or a financial adviser. Or an oncologist? This, combined with almost overwhelming competition from Google, has made life very difficult for the reviews sites. Comment: All a site needs to 'weed out suspicious reviews' is effective moderation and a flagging system for users. We were surprised that the Times had not contacted the CMA - as the UK regulator ultimately responsible for reviews - to ask for their opinion. The reasons for all three of these rules should be clear: businesses must not mislead consumers. And there's absolutely no need: this article, covering much of the same ground, includes results for our clients achieved without playing fast-and-loose with the regulations.